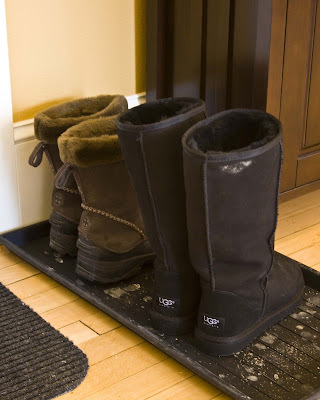 This is a picture of the only two pairs of footwear that are getting any action this winter. Goodbye cute high-heeled boots, winter ballet flats, and leather wedge heels. And you too, stilettos. Sadly none of them can keep my feet dry in the five or more inches of snow between me and my garage. So all the cutie shoes are packed up in the basement and these boots only ones getting any wear in Des Moines. *sigh* I guess I should look on the bright side of serious winter living... I am saving a ton on pedicures! I know how you feel girl!! We have had snow on the ground since mid November!! UGH!! Haha. That's what my shoe area looks like too! Boots, boots, boots. The other day I tried to wear cute shoes and regretted it big time! Summer will come and it will be fun to bust out the high heels once again.